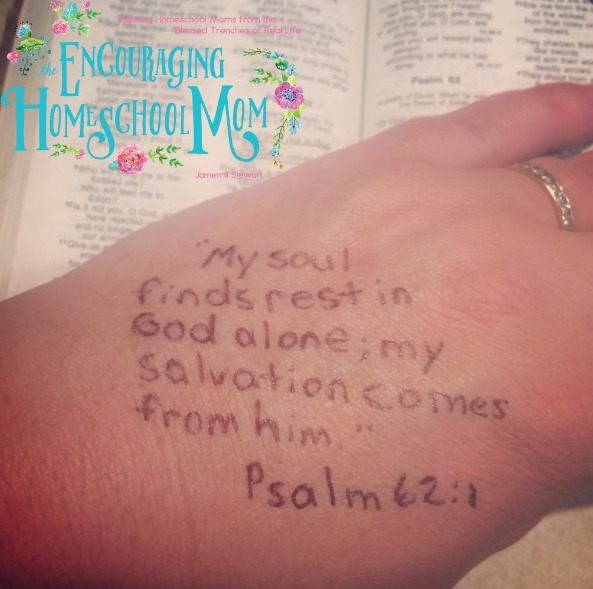 It’s no secret that as moms we quickly find ourselves smack dab in a place (that “place” being daily life) where we know we need to cling to God’s word for all it’s worth. These little people need us, and boy that fact quickly points us back to Jesus and our desperate need for Him! The truth is each day I need the Lord to breathe on me. I pray for the Lord to strengthen me, give me wisdom, and help me daily serve and minister to my family in a way that brings Him glory. Of course, I can’t do any of this mothering thing without His full empowerment. Many years ago I shared Creative Ways to Get More Jesus in Your Day including ideas such as playing an audio Bible, playing worship music, leaving a good Christian book accessible (the bathroom, hello! ), reading the Bible with our children like during family Bible time, and more (you can read my thoughts from 2011 here). I used to print out Bible verses on printer paper and hang them around the house. Even before that, I wrote Bible verses on notecards and placed them in the kitchen window for when I hand-washed dishes. I would carry a notecard in my back pocket or my purse. I kept a verse on a notecard on my van dashboard, in my wallet, wherever I might need my eyes to rest on the Word. But over these years as our family has continued to grow, it’s not always practical for me to pull a notecard out of my pocket to meditate on the Word. More often than not these days I’m also juggling a baby, toddler, homeschooling a herd, finding my morning coffee forgotten on reheat in the microwave at 4 p.m., getting something in the slow cooker, or just trying to sit for a minute. 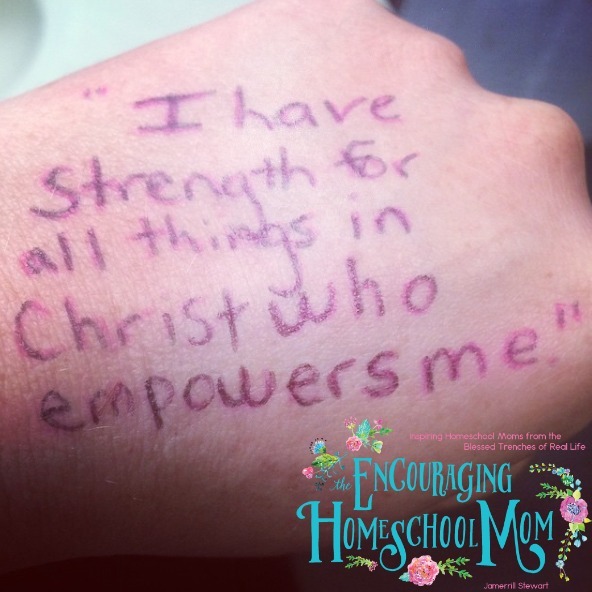 There’s a lot to this homeschool mom life or any life of a mom for that matter. 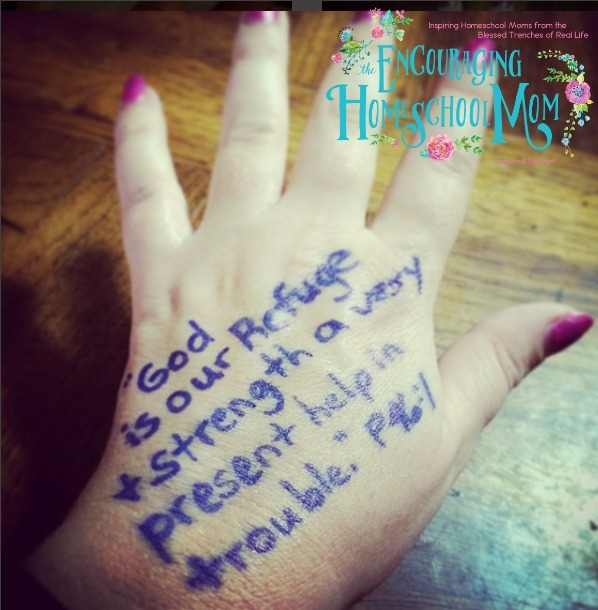 One of the many times #handverses have helped me! Two years ago, when I was pregnant with our seventh child, I was feeling hurried and pressured on a particular morning. My to-do list was screaming, needs were all around me, and I desperately felt in my heart that I needed a fresh verse to devour and feed my spirit throughout that day. Putting my focus in the Word, during that very busy day, gave me the strength to accomplish the seemingly impossible. The Holy Spirit met me in that verse, whispered over me, encouraged my heart, and gave me great hope. Scrambling eggs, I focus on my verse. Dealing with real life stuff, I attempt to respond calmly and practice my verse. *insert some other* pressure, weakness, or trial that comes at me, I say my verse over and over and over and over and over. Not that life isn’t blessed. The Lord is good! I just need the constant reminder for my “very human head,” as I shared in 7 Personal Routines to Help a Momma Feel Human. “The Lord reigns, he is robed in majesty; the Lord is robed in majesty and is armed with strength. The world is firmly established; it cannot be moved.” Psalm 93:1 NIV from my Instagram. Focusing on God’s Word gets my mind off of me, off my failings, off my holes and inconsistencies. Having a promise so close, in my face if need be, reminds me who my Father is, and who I am in Him. Believe me friends, no perfection here. I am simply a lady who desperately needs the Lord more and more each day. Focusing on God’s Word keeps my heart on Jesus, and quickly gets my heart back on Jesus if I need to realign myself in faith. Did I start to worry, feel confusion, or let stress or anxiety creep in? For me, that usually means my mind has gotten too busy reasoning or trying to figure things out. I need to remember who my father God is, and what His good promises are for my family and me. There’s power in God’s Word. When I keep my mind running through a verse or several verses throughout the day, it affects how I feel. I physically feel stronger. I’m mentally sharper. I feel freedom in knowing that my Father has me. 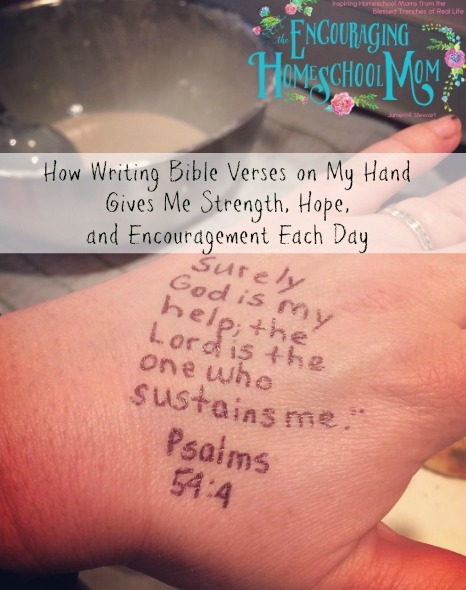 For me, having a Bible verse on my hand has been a practical way to intertwine the Word into every fiber of my day–changing poopy diapers, wiping noses, transplanting hostas, making tacos, playing in waterfalls, dealing with the hearts of little ones and big ones (my own heart included), and the list goes on. 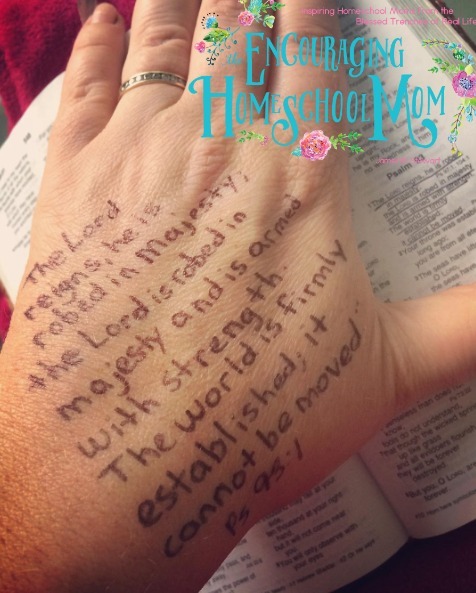 This simple practice of writing one Bible verse on my hand helps keep my heart and mind in check. It invites the Holy into the practical and overflows my heart with reminders of God’s awesome goodness. I wanted to share this with you in case you needed a doable way to keep God’s Word alive in your heart each day, too. I also saw another idea of memory verse bracelets. A lady on etsy sells them. They are called Keeplets. 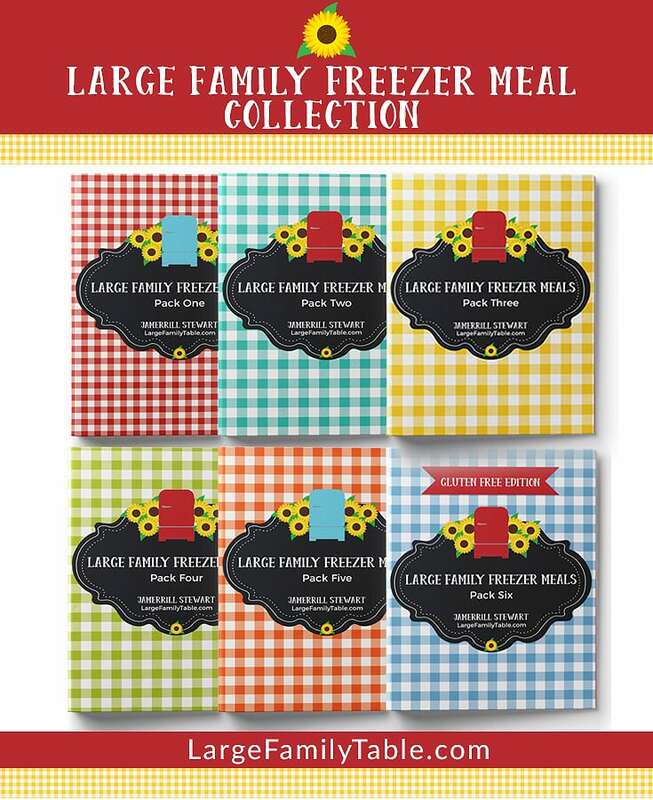 They are made of fabric and a easy snap closure with a clear pocket to slip in the small paper with a verse. 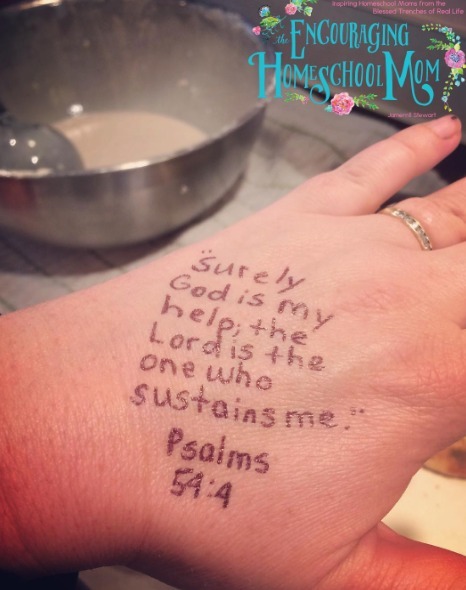 This would be great for my kids too who are learning a new verse to always have it with them. Love this idea, might give it a go. What church (denomination) are you guys part of? Anything I write on my hand disappears quickly from the 50,000 hand washings throughout the day. I thought of using sharpie, but I’ve read it isn’t safe. How do you keep it on all day?